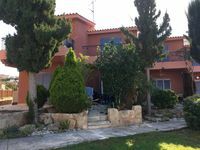 Property 5: Lovely family friendly house with just a short walk to the Paphos attractions. Property 11: Rosetta Villa, Brand New Villa with private pool. Property 19: Delightful Villa with Stunning Sea Views and Communal Pool. Free Broadband. Property 21: Modern 2 bedroomed Poolside Townhouse at Desire Gardens Peyia. Property 24: Stunning 2 bedroom house in popular Tomb of the Kings area with shared pool. Property 29: Well appointed 2 bedroom town house close to all amenities with internet. Property 41: Sunrise 2 bedroom villa. The property was just as expected. The previous reviews have said it all. Andy and Nic were great hosts, easy to communicate with, and helpful with anything we needed. If you want peace and relaxation this is the place! We would love to come back when the weather is a bit warmer and we can use the pool.